The Ontario government delivered its budget on May 1st; the NDP announced they would not be supporting the government any longer on May 2nd, and the Premier threw in the towel putting Ontario into an election campaign. The budget may never have been intended to be practical, but created solely to be a "zombie" document to reference during a campaign. I was surprised to see the budget repeated a graphic based on the same Hydro-Quebec (HQ) report I debunked in picking apart Environmental Defence's lousy report on Ontario Energy Costs. 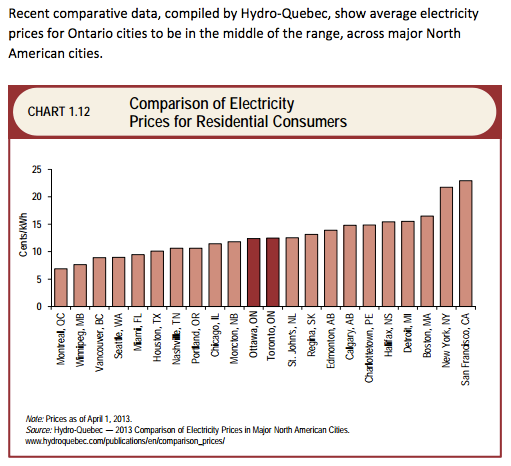 The HQ report graphs values of 12.475 cents/kilowatt hour (kWh) on a 1000kWh bill) for Toronto  and 12.391 cents/kWh for Ottawa. I don't mean to criticize the HQ report, although those are the two figures I know best in it and they are wrong. I do mean to criticize the former Ontario government that cynically included numbers from HQ in an Ontario budget. While I'm at it, I'll criticize their base too - apparently the urban voters favouring the Liberal party can't figure out what they pay for electricity, and that it is not what their government tells them Quebec's public electricity company reports they are paying. One more stab at showing HQ estimates are low. 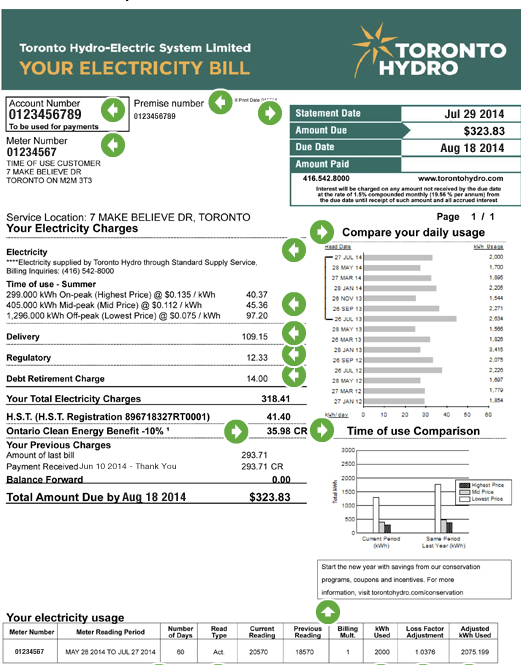 The sample bill from the Toronto Hydro website shows pricing of $323.83 for 2000kWh of consumption over a 2 month period. That works out as 1000kWh a month (as in the HQ study). It works out as 16.2 cents/kWh (unlike the HQ study) - if you ignore that the Ontario Clean Energy Benefit discount is paid by taxes (or additional government debt). Without the OCEB the bill is over 17.5 cents/kWh on consumption of 1000kWh. 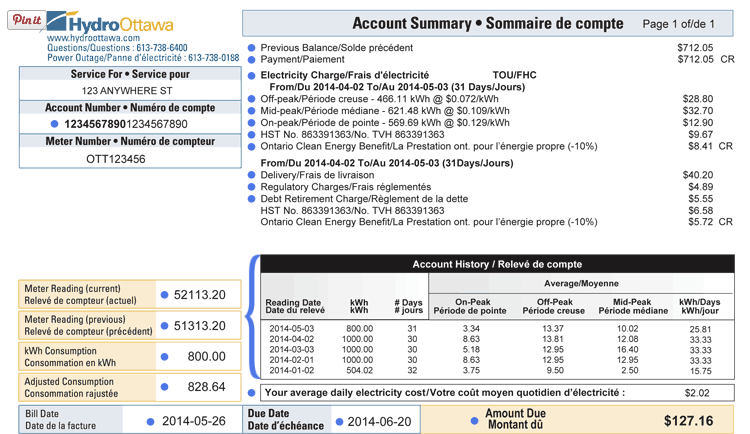 The Ottawa Hydro sample bill is less coherent, but appears to be claiming using 800kWh a month would result in a bill of $127.16; an average of 15.895 cents/kWh. That's 28% higher than the HQ study claims the Ottawa pricing was a year earlier. Quite the inflation ... or just bad data in HQ's study. That belongs in the delivery charge and the transition should be made 5 years ago (I think the Ontario Energy Board anticipates it will be made within a year). Ottawa Hydro's sample bill is particularly entertaining as not only do they still tack on the tacky line-loss adjustment, but they show the 800kWh of metered consumption as being comprised of 466.11kWh Off-peak, 621.48 kWh mid-peak and 569.69 kWh on-peak. No wonder nobody pays much attention to the details on their bills - but I'm not sure they should continue to show the same disinterest in their ballots. 2. My local distribution company (Hydro One) did cease the line-loss adjustment last year; the online hourly data they make available for download adjusted all figures back to the installation of my smart meter. 3. Soon after I wrote this, the sample bill on the Ottaws Hydro site was corrected - sort of. The TOU rates now add up to 800kWh (if their billings are the same as my Ontario Hydro bill once was, they'd up to the "adjusted consumption" shown in the meter section of the bill, but it's now close). When they fixed the figures the cost rose to $130.11, so it works out to 16.26 cents/kWh - essentially the same as the Toronto Hydro sample bill's average.